Perhaps whether we like it or not and whether we know it or not, ideas and beliefs are arranged in an order of dependence so that certain beliefs form the conceptual basis from which and upon which all of our other beliefs depend. Understanding and decisions on more fundamental or major questions affect positions on subsequent major and minor issues. In other words, for each one of us there are certain values, beliefs, or decisions that take priority over all others and by which all others are subsequently determined. However, it is perhaps also true that an individual may not be aware of or have identified what his or her "belief priorities" are, let alone why they have adopted them, where they come from historically, and what has influenced them. 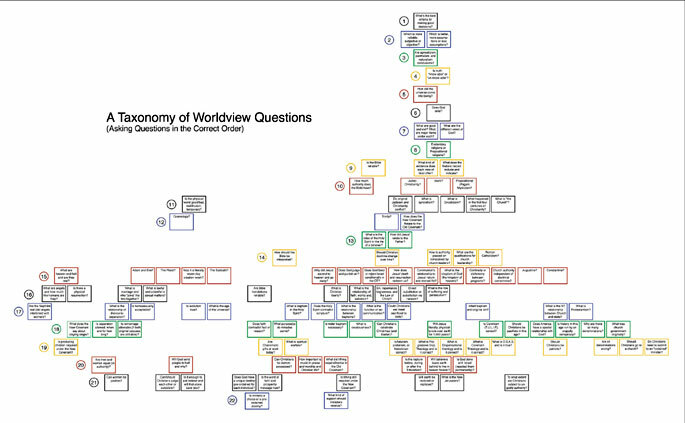 This chart as well as the "Taxonomy of Worldview Questions" are designed to show the relative hierarchy and flow between individual concepts within theological thought and history. The overall concept behind the chart below is to show the connection and influence between an idea and the other ideas or historic trends that are related to it. 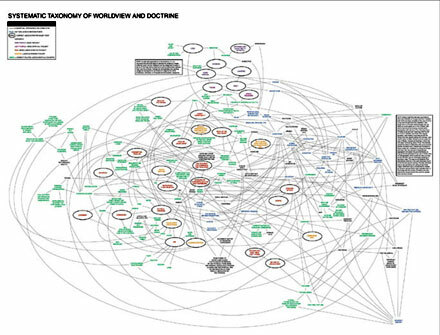 In this way, the interwoven connections in Systematic Theology (or Systematic Philosophy) are displayed. Although complex, given the sheer volume of theological and historical concepts inherently involved in any systematic understanding, the goal is to illustrate the importance of knowing where ideas come from and what individual ideas depend on and to help better illustrate why certain concepts and approaches are correct. As the symbol key in the upper left-hand corner of the graphic below indicates: A.) lines represent "conceptual connection or dependence," B.) dark purple text represents "major points and questions of basic thought," C.) light purple text represents "major points or questions of basic spiritual thought," D.) blue text represents "key non-Christian concepts," E.) circles represent "major correct points in Judeo-Christian thought," and F.) red, orange, and green text represent "correct points of Judeo-Christian thought" in a relative descending order from more to less fundamental.